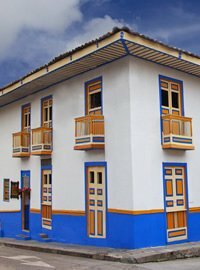 In Salento Colombia The Ciudad de Segorbe Hostel, Bed and Breakfast; welcomes people from places all over the world. 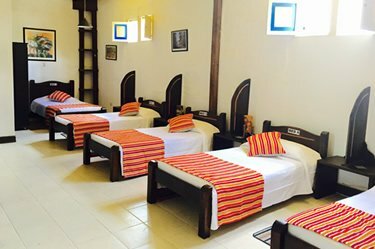 Peaceful and spacious seating areas especially suiting those looking for tranquility amidst unbelievable landscapes and friendly people. Set amongst the magical and unique forests of the "Wax Palms" (Colombia´s National tree, and one of the highest species of the world). 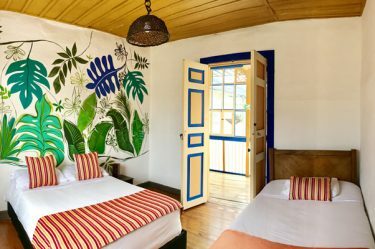 The Ciudad de Segorbe Hostel, Bed and Breakfast in Salento Colombia it is located two blocks from Salento´s main square allows visitors to explore one of the Colombian first destinations for ecological tourism. It is highly recommended for people to enjoy nature and to discover something magical and diferent in the National Snow Park. Free daily breakfast available from 07:00 A.M. to 9:00 A.M. Enjoy our complimentary breakfast designed with a variety of details, all for the pleasure of your stay. 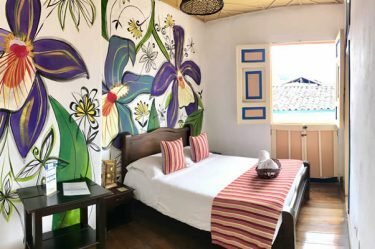 It consists of fresh fruits in season, natural mixed fruit juice, traditional bread or arepa, selected jelly and butter, cheese or ham, cereals and milk, eggs, Colombian special coffee and lemon flavored water, natural aromatic herbs or selected fruits.